There are lots of lovely decoupage layer which I hope show up in the photo. For anyone interested in joining our group it's called the RAK club and stands for Random Acts of Kindness. It means that the lovely Gill, who hosts it sets the theme for the month and gives us the person to send a card to. Consequently we all get to receive something lovely in the post other than bills and junk mail! Checkout Gill's blog for more info. 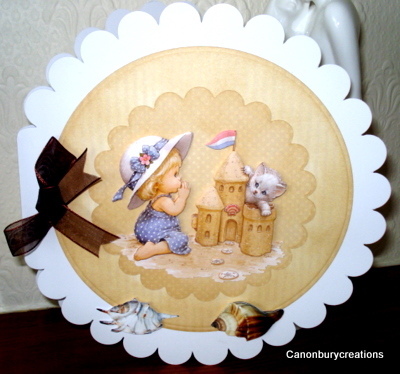 What an adorable image that Linda's used on this card. It certainly fits the theme of a shaped card as well. Wow I love this card and the design is Fabulous!!!!!! OMGoodness! Look what Linda did with that image. It seems so lively and dimensional.